Strong Hold with No Pasty Ooze. 1. 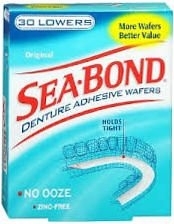 Place dry Sea-Bond wafer on denture. If too large, trim overlapping wafer with scissors. 2. Clean denture thoroughly. Moisten wafer with warm water. 3. Position moistened wafer with WHITE SIDE up. Smooth wrinkles with finger. 4. Place dentures into mouth. Hold firmly until secure. If wafer does not hold, moisten wafer more thoroughly. 5. To remove wafer from denture, lift corner and peel away. Change wafer daily.